Faster than anything in the universe! Sustainer of life as we know it!<br< <br< What is this miraculous, mysterious thing? It’s light. And you can be its master with optics, the science of the future. Optics lets you:<br< - Bend light around corners<br< - Stop time with a pair of sunglasses<br< - Capture light on a silver tray<br< - Magnify pictures with an ice cube<br< - Pour light into your palm<br< - Project a big-screen image from your small TV<br< - Fool a doorbell with a bike reflector<br<<br< Once you get your head and hands into optics, the world will never look the same again. That’s a promise.<br< Illustrated by Theo Cobb.<br< Ages 11 and up. Light makes the world visible to us. But what is light? For centuries scientists have tried to answer that question by experimenting with light and observing its behavior. Now you can, too. Here, in dozens of exciting experiments, using materials that are readily available, you can make your own scientific observations. What amazing things happen when you block, bend, bounce, catch, or scatter light? A pencil appears to bend in a glass of water. Light pours out of a glass jar. You can make a sunset in a glass of water. Figure out how to polarized sunglasses block glare. Observe the results as green plants catch and transform light. Each experiment will reveal something about the nature of light. Vicki Cobb and Josh Cobb provide easy, fun-to-follow instructions. Theo Cobbs's clear, appealing illustrations make the experiments virtually foolproof. Try just one, and you�ll want to do more! 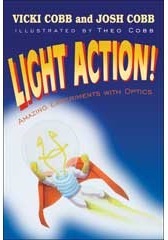 You�ll be on your way to discovering the world of optics.